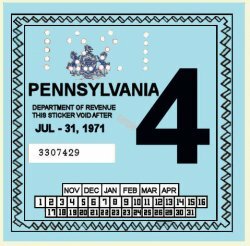 1971-4 Pennsylvania Inspection Sticker - $25.00 : Bob Hoyts Classic Inspection Stickers, Add a Final Touch to your Restoration! This 1971-4 Inspection sticker was the last of four distinctively different stickers issued from 1970 to 1971. This series was the last issued by the PA Department of Revenue. Starting with the next series in later 1971, then they were issued by the Department of Transportation. This was issued in January, 1971 and expired in July.